对全球第一的搜索引擎 (中国第二) 进行封锁发生在周五晚上。 这个可能是某人不小心按错了按钮， 对错误的域名进行了DNS污染. 他们可能只想封锁 mail.google.com. 如果这是一个错误, 这可能能解释为什么封锁在今早解除了. 这样的话, 至少有一个中国国家防火墙的雇员会被解雇. 但是, 我们有一个理由相信这不是一个错误. 中国政府不仅封锁了 google.com 和其子域名 (比如 mail.google.com, play.google.com, maps.google.com 等)，他们还DNS污染了 google.com.hk 和 google-analytics.com. 这不可能是一个错误导致的 - 他们必须添加3个封锁规则. 如果这不是因为错误导致, 这次对Google封锁还可能因为什么? 我们之前讨论过中国政府没有对Gmail进行封锁只是因为他们害怕民众对全面封锁Gmail的反应. 但是,他们曾使其访问速度缓慢，不稳定. 在2011年3月, 他们似乎准备全面封锁Gmail,但最终没有这样做. 这次迅速解除对Google的封锁是在在测试人民的反应么?你可以在这里浏览新浪用户对此的反应. 显然，公众对不能访问Google，Gmail表示不满。 许多用户将此归咎于正在进行的全国代表大会.可能中国政府也了解到人们的反应，知道了人们对此决定深感不满? 令人感兴趣的是, 新浪微博没有对搜索关键词"Google"或者“谷歌”进行限制. 而且，他们似乎也没有, 删除最近Google的微博。 这可能是故意的, 因为他们也想观测用户的反应. 可能现在他们具体了解了公众对无法访问Google的反应,并且能作出在未来是否永久封锁Google的决定. 还有一种可能性是中国政府在测试“封锁Google”按钮. 中国政府可能想知道, 如果他们某日决定封锁Google, 他们能立马对其进行完全的封锁么.如果这真的是一个封锁测试, 时间上是恰当的(星期五晚上, 国际金融市场关闭). 无论你对过去24小时有怎样的看法, 我们似乎回到了原点. 换句话说, Google没有被完全封锁, 但许多Google服务被单独的审查, 从完全封锁到部分封锁. 特别注意的是, Gmail非常不稳定, 这可能是因为，一个或多个IP地址被封锁. Is China establishing cyber sovereignty in the United States? Last week Twitter came under attack from a DDoS attack orchestrated by the Chinese authorities. While such attacks are not uncommon for websites like Twitter, this one proved unusual. While the Chinese authorities use the Great Firewall to block harmful content from reaching its citizens, it now uses DDoS attacks to take down content that appears on websites beyond its borders. For the Chinese authorities, it is not simply good enough to “protect” the interests of Chinese citizens at home - in their view of cyber sovereignty, any content that might harm China’s interests must be removed, regardless of where the website is located. And so last week the Chinese authorities determined that Twitter was the target. In particular, the authorities targeted the Twitter account for Guo Wengui (https://twitter.com/KwokMiles), the rebel billionaire who is slowly leaking information about corrupt Chinese government officials via his Twitter account and through his YouTube videos. Guo appeared to ramp up his whistle-blowing efforts last week and the Chinese authorities, in turn, ramped up theirs. It’s been three years since Eric Schmidt proclaimed that Google would chart a course to ending online censorship within ten years. Now is a great time to check on Google’s progress, reassess the landscape, benchmark Google’s efforts against others who share the same goal, postulate on the China strategy and offer suggestions on how they might effectively move forward. 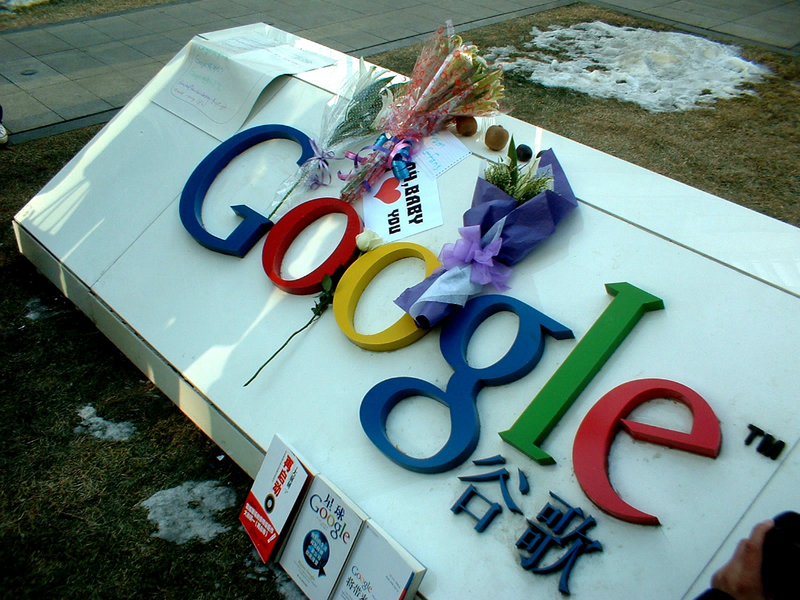 Flowers left outside Google China’s headquarters after its announcement it might leave the country in 2010. Photo: Wikicommons. What has Google accomplished since November 2013? The first thing they have accomplished is an entire rebranding of both Google (now Alphabet) and Google Ideas (now Jigsaw). Throughout this blog post, reference is made to both new and old company names. Google has started to develop two main tools which they believe can help in the fight against censorship. Jigsaw’s DDoS protection service, Project Shield, is effectively preventing censorship-inspired DDoS attacks and recently helped to repel an attack on Brian Krebs’ blog. The service is similar to other anti-DDoS services developed by internet freedom champions and for-profit services like Cloudflare. Facebook is considering launching a censorship tool that would enable the world’s biggest social network to “enter” the China market. Sadly, nobody will be surprised by anything that Mark Zuckerberg decides to do in order to enter the China market. With such low expectations, Facebook is poised to usurp Apple as China’s favorite foreign intelligence gathering partner. If the company launches in China using this strategy they will also successfully erase any bargaining power that other media organizations may hold with the Chinese authorities. There could of course be another option: your initial report was wrong. Well, Google Docs is STILL blocked in Ningbo, China, as of November 12. Incredibly annoying as I use it as a teaching tool.